The IRSTS 1-2-3 rule, presented by author Sylvain Vervoort in June 2013 issue, originates from classic swing trading philosophy. With our simplified rendition of Vervoort’s quite complex system in our C# code, based on fixed percentage swings, we laid out a framework for detecting the 1-2-3 waves. The system marks each Wave on the chart, connecting them with colored lines, and enters on pullbacks in the direction of the primary trend (Wave 1). Its exits are simple profit target and stop loss based on optimizable percentages. Motivated trading system developers are welcome to experiment with adding other entry/exit rules and tweaking the swing detection routine. For example, consider range bound markets. 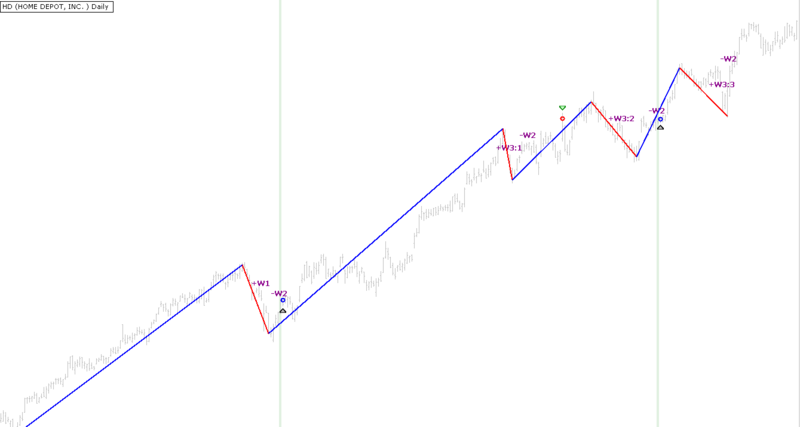 Wave 3, breaking through its father Wave 1’s extreme price, gets interruprted with a correction Wave 2 and then with Wave 1 in the opposite direction, signaling a potential trend change. In this case, the size of a correction wave may be taken as a factor when defining a new Wave 1: penetrations may only be considered significant if the preceding wave's extreme is broken by a multiple of the wave’s magnitude. In our opinion, this has a chance of improving overall performance of the technique in choppy markets, protecting from changing direction too soon. On a closing note, the companion SVEHLZZperc indicator has been added to TASCIndicators library. Conceptually, it's a variation of the well-known trailing reverse method with a twist that combines fixed percentage swings and volatility reversals. Figure 1. A Wealth-Lab 6 chart illustrating the application of the IRSTS 1-2-3 rule on a chart of HD (Home Depot Inc).